Why have your gutters professionally cleaned? Your gutters are in fact a vital part of the water proofing system for your property, and keeping them clean and clear will over the years save you spending out on what can be expensive repairs. If your gutters become blocked they can start to over flow down the side of your building, walls and on to paths which can lead to many forms of damp or mould problems. 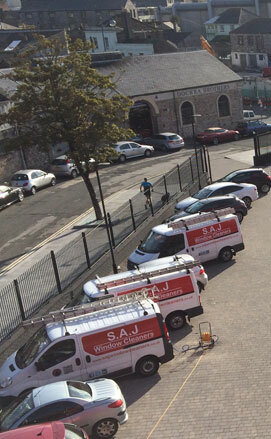 SAJ Gutter Cleaning based in Plymouth and cover Devon and Cornwall are fully insured specialists for Commercial Gutter Cleaning Residential Gutter Cleaning. We safely and efficiently clean your gutters and thoroughly unblock downpipes. Gutter Cleaning at any height The method we use is the Gutter Vac system combined with lightweight carbon fibre poles with a camera attached. The Gutter Vac system is effective to clean gutters up to a height of 50 feet (roughly four storeys) over that height we use cherry pickers for efficiency and health and safety reasons. 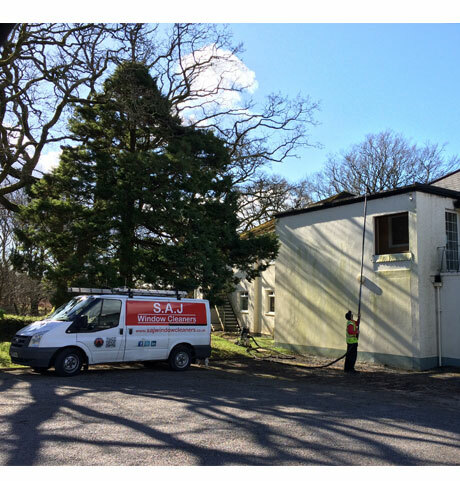 FREE site Survey and Guaranteed Work SAJ Gutter Cleaning offer a Free site survey with digital camera images of before and after we carry out our Gutter Cleaning Service to ensure that everybody is satisfied with the quality of the Gutter Cleaning. Professional and equipped with own Generator because we come equipped with our own generator attendance is not required, which offers flexibility as to when the gutter cleaning is carried out. On completion we provide a digital photo as proof of work completed, we are Fully insured, HSE trained & uniformed.